McKinsey PEI - Any difference between conflict and disagreement? Is there any difference for a McKinsey PEI question concerning conflict vs. disagreement? Is one just more extensive than the other? In the context of McKinsey Personal Experience Interview prep, you can use those 2 words interchangably. When it comes to the Leadership and Personal Impact Dimension, the main point is talking about a ‘difficult’ situation, i.e. a situation in which not everything was going smoothly but which really tested your interpersonal skills to still succeed in the situation. That’s an interesting situation to discuss for your interviewer. Whether you label a ‘difficult’ situation as a conflict or disagreement is just a different wording for this purpose, just make sure your examples focus on specific ‘difficult’ situations! 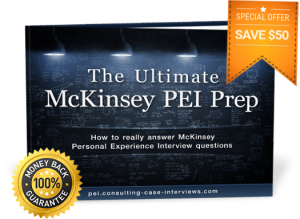 You can find much more information about how to succeed in your McKinsey examples in The Ultimate McKinsey PEI Prep eBook! Previous Previous post: Not yet prepared for my McKinsey PEI – can I postpone my interviews?